Prevalence is less than 1 case per 300,000 individuals. Lamellar ichthyosis affects all populations. The disease is present at birth and continues throughout life. Patients with lamellar ichthyosis have normal life spans. 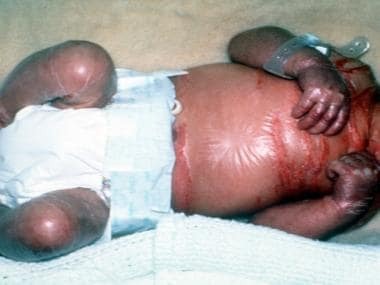 In the neonatal period, following the shedding of the collodion membrane, the newborn is at risk for secondary sepsis and hypernatremic dehydration. As the child ages, the hyperkeratosis can interfere with normal sweat gland function, which can predispose to heat intolerance and possible heat shock. Ectropion may result in the inability to fully close the eyelids and can cause exposure keratitis. External auditory canal stenosis and tympanic membrane blunting may result in a conductive hearing loss. Osseointegrated hearing devices may effectively bypass this hearing defect. Foundation for Ichthyosis and Related Skin Types (F.I.R.S.T), 2616 N. Broad Street, Colmar, PA 18915; telephone: (215) 997-9400, http://www.scalyskin.org, email: info@scalyskin.org.